Welcome to our guide to American made furniture brands. A lot of furniture production moved overseas in recent years, but you can definitely buy quality American-made furniture. Living room, bedroom, and dining furniture is still made in the USA. Most of the La-Z-Boy recliners, sofas and chairs are built in America. They have 5 manufacturing plants (Tennessee, Mississippi, Missouri, Arkansas, California). The company is obviously known for recliners but they also make sturdy, fashionable sofas and other upholstered furniture. Much of it is traditionally styled but they make contemporary items too. 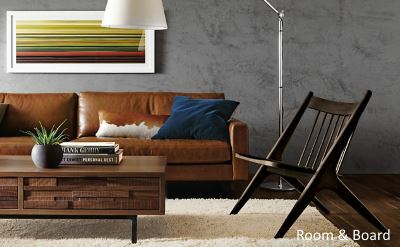 More than 90 percent of Room & Board's products are made in America. Their furniture is made by partner companies in 12 states. I bought a sofa, bedroom furniture and other pieces from them. It's quality built stuff in attractive modern designs. Room & Board has a few stores across the nation, but I think most of their sales are done through their mail-order catalog. They offer flat-rate full-service delivery, and they do all the assembly. American Leather is an interesting company that you might not know about. They make quality furniture to order in their high-tech factory outside of Dallas. More than 650 stores sell their products. Despite the name of the company, Della Robia makes modern furniture in the USA. These are high-quality, high-style products that don't cost an arm and a leg. 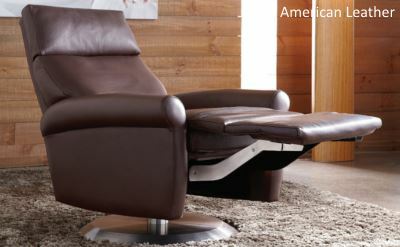 Della Robia is famous for sectional sofas, but they make a wide range of chairs, sofas and bedroom furniture. 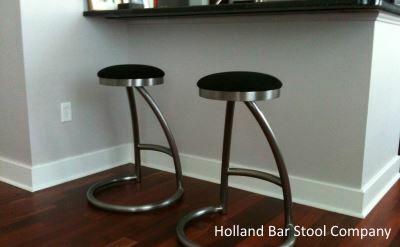 The Holland Bar Stool Company manufactures in the USA. In Holland, Michigan actually, which is where the name comes from. They make barstools in a wide variety of styles, including the best modern barstools made anywhere. I bought the ones in the photo -- they're sturdy and very good-looking. 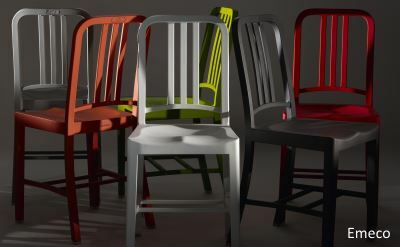 Emeco has made famous chairs since 1944. They're made in Pennsylvania from 80% recycled aluminum. Skilled craftsmen manufacture enduring products guaranteed to last a lifetime. Their 1006 Navy chair is a design classic. These are just a few of the many brands of American-made furniture. We'll add more to the list soon.